On August 12010 for Artists on Art, I had the pleasure of interviewing composer, producer, music educator, writer, producer, choral director, and art activist, Stephen L Bigger. 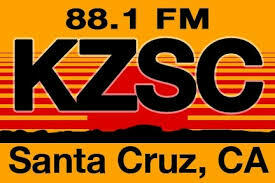 He also brought along a few guest singers a for live performance in the UCSC KZSC radio station. 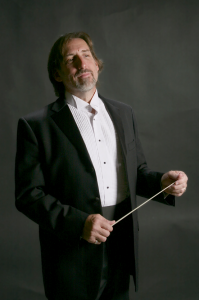 He is a third generation choral director and educator who has produced over 300 songs per year while working in Nashville, Tennessee. He has a wide range of musical interests from pop, rock, folk, gospel singing and world choral music. A full list of all his work can be found at his music publishing and production company, Rock Arbor Music. He formed this company in 1981. Stephen L Bigger is organizing a brand spanking new choir is happening in town and it’s called the Santa Cruz World Choir & Orchestra. He is motivated to take on this huge endeavor, getting a choir and orchestra together when the economy is tough and toughest on the arts, because of the decline of music education in our public schools. The SCWCO’s repertoire includes a wide range of music from around the world, from traditional to modern, ranging from Gregorian to Gaelic to Gospel. Stephen has plans to build the choir to 60 voices. An ensemble of initially 12 to 20 musicians will accompany the choir for performances. Music teachers or skilled performers on traditional instruments such as strings, woodwind, brass, percussion, and instruments from around the world will work alongside students. The orchestra will eventually grow to full symphonic instrumentation. “My vision is to be part of a thriving community of collaborative performance ensembles that provide the opportunity for people to create wonderful music with others and to enrich the lives of audiences,” said Bigger. To build this choir there will be a series of informational open houses for interested singers and musicians to meet Bigger and members of the choir, learn about the repertoire, rehearsal and performance schedule, and view videos of Stephen’s past choral groups and music projects. The open houses will be held on sequential Tuesdays, August 24 & 31 and September 7, from 7 pm to 9 pm at the Soquel Congregational Church Fellowship Hall, 4951 Soquel Drive, Soquel. 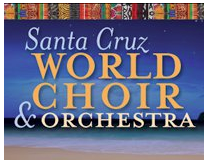 For more information go to Santa Cruz World Choir or call 831-521-3470. Half way through the show, Vanessa Yearsly (soprano), Grace Crandall (alto), Judd DiSalvo (tenor) and Jacob NIchols (bass) sang a live performance of a Mongolian “happy that we’re together” song entitled Dorven Dalai. Since moving to Santa Cruz and between 2008-2010, Stephen was Choral Director and Theater Technical Director at Aptos High School. This is how this group of singers got together and are going to continue singing together in the new Santa Cruz World Choir and Orchestra. Below is the full recording of our live broadcast. Nada, Thank you so much for having us on your wonderful show! And thank you for all you are doing for art and artists in Santa Cruz! Now… someone needs to interview you! Thanks!